Paul Carlisle and Rodger Alexander ran the Hope Wakes 10k fell run in Derbyshire on Wednesday 26th June, taking 60:39 and 55:50 respectively to complete the course. At the Chelmsford Parkrun, Joe Alexander came 2nd in 16 minutes and 2 seconds, a new PB. The Capel 5 race was held on the morning of Sunday 30th June; a challenging, hilly course exacerbated by the hot and sunny conditions. 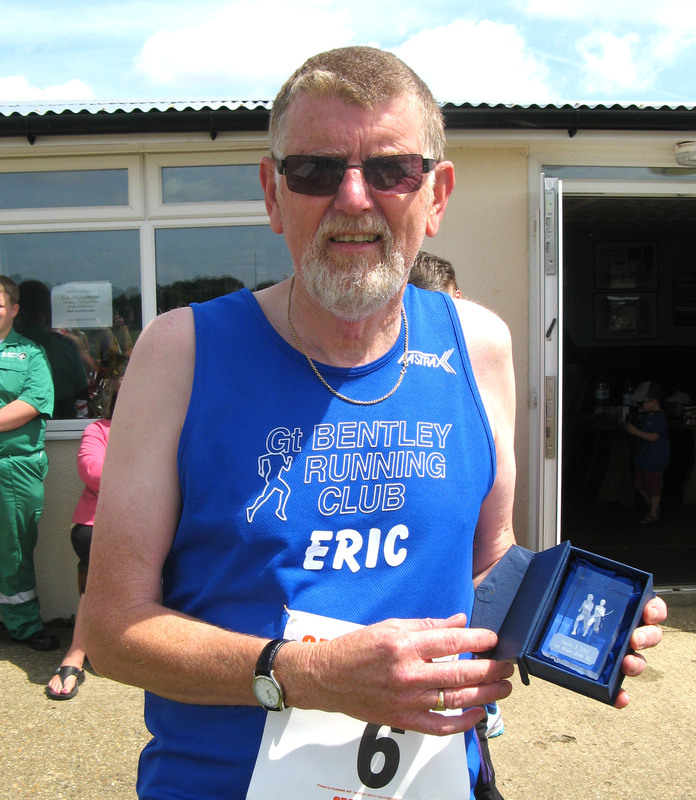 Eric Shaw stole the show for Great Bentley, crossing the line in 39:08 and taking the prize for first male over 60. Dan Foster 31.52, Clive Thomas 31.55, Charlie Keitch 32.12, Mark Ross 37.49, Anna Lyon 38.00, Ryan Bedingfield 38.23, Scott Young 38.24, Karen Skene 40.25, Janine Simpson 40.48, Lorna Sharp 41.29 (bronze age related standard), Barry Martin 45.12, Nicola Thornton 52.44, Amanda Prior 53.36 and Ruth Metcalfe 1.04 37. Harry Prior came 8th in the junior race in 6:20. On the same morning, Ben Ficken ran the Round the Island race at Mersea, a punishing 12.2 mile race in the hot weather over footpaths and sandy beach. Thursday 27th June saw the third leg of the Harwich 5k series run in almost perfect conditions, without the customary headwind on the return journey. Charlie Keitch and Phil Presland both attained new PBs, Keitch in 18:26 (silver age related standard) and Presland finally breaking the 21 minute barrier in 20:59. Louise Reeve also PB’d in 28:53, as did Brian Telford in 21:43. Other runners were Peter Reeve 28:55, Dave Nugent 37:07, Chris Hayes 24:58, Kevin James 21:25, Sandra James 31:07, Ray Baggs, 19:39, Jason Bennett 24:57, Frank Gardiner 23:41, Stuart Baggs 26:39, Rita Page 35:41, Lesley Fuller 28:54, Scott Young 21:49, Lara Townsend 23:08, Davina Swindell 24:23 and Vicky Presland 21:09.